The Truman Today will not be published next week due to midterm break. The Kohlenberg Lyceum Series Presents Tony Waag's "Tap City"
Health science honorary fraternity Eta Sigma Gamma is sponsoring a highway safety awareness campaign on Truman’s campus through March 11. The purpose of SAFEBRAKE is to promote safe driving among students, particularly during the upcoming midterm break. Truman’s Flame to the Second Century will be lit from 8 a.m.-7 p.m., March 8, in dedication of those who have lost their lives in automobile accidents. A flower memorial will be set up near the flame along with a sign displaying the names of Truman students who died on local highways. All Kirksville residents and members of the University community are welcome to visit the memorial. Additionally, individualized memorial posters will be hung throughout the campus during the week. Other SAFEBRAKE activities include a motivational speech at 6:30 p.m., March 8, in Pershing Building 325. Tim Landwehr, a member of the motivational organization “Think First,” will tell his personal story about a car accident that left him with a traumatic brain injury. From 1-3 p.m., March 9, the Missouri Highway Patrol will do a roll-over car simulation behind the Physical Plant. Missouri State Highway Patrol Sgt. Brent Bernhardt will be available to answer questions about safe driving following the simulation. Students, faculty and staff can also gather information about safe driving at an informational table set up in the Student Union Building throughout the week. For more information on SAFEBRAKE, contact Emily Forsyth at 665.2933. Students who will intern in Washington, D.C., during the summer 2005 stand with Julia DeLancey, campus co-liaison, and Garry Gordon, vice president for academic affairs. Pictured from left to right are DeLancey, Sarah Cunningham, Ryan Lewis, Christine Schlosser, Trevor Marlow and Gordon. Four students have been accepted to the summer 2005 Truman in Washington Program. These students will intern for various agencies throughout the Washington, D.C., area. The following students were selected: Sarah Cunningham, junior pre-business administration major from Sedalia, Mo. ; Ryan Lewis, junior history major from Chesterfield, Mo. ; Trevor Marlow, senior communication and English double major from Columbia, Mo. ; and Christine Schlosser, senior communication and political science double major from Cape Girardeau, Mo. 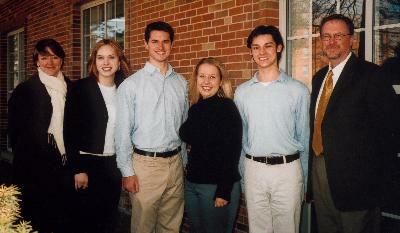 In addition, the four spring 2005 interns from Truman have been placed. Tony Albrecht, senior English major from Chesterfield, Mo., is working at the Environmental Protection Agency in the Office of Transportation and Air Quality, Media Relations. Matthew Hanley, senior history major from Kirksville, is working for the Coast Guard. Amanda Knox, senior communication major from East Troy, Wis., is working in the Office of Air and Radiation for the director of communications at the Environmental Protection Agency. Corey Owens, junior communication major from Blue Springs, Mo., will work for the American Civil Liberties Union. All of these students will earn academic credit for their work experience. Students interested in applying for the Truman in Washington program should contact the campus co-liaisons, Julia DeLancey and Diane Tobin Johnson at campusliaison@truman.edu. Starting fall 2005 interested students should contact Tobin Johnson at the same address. The University Art Gallery is displaying artwork from across the United States for the 15th Annual National Art Competition. The new show exhibits pieces from artists selected by juror Dean Sobel, the director and chief curator of the Aspen Art Center. Sobel chose eight artists to showcase their work in this year’s competition. A focus on fewer artists and a small-group format for the show marks a change from past years. Sobel said he wanted to present quality over quantity in terms of the artwork. “My hope was to select an exhibition that was not simply the best eight artists, but rather, to select a group of artists that would span media and styles,” Sobel said. The art competition pieces will be on display through April 9. The Art Gallery is open Mondays-Thursdays from 8:30 a.m.-7 p.m.; Fridays from 8:30 a.m.-5 pm., and Saturdays from noon-4:30 p.m. For more information about this exhibit or other Gallery presentations, contact Aaron Fine at 785.5386 or afine@truman.edu. Mona Lisa Saloy of New Orleans, is the winner of the 2005 T.S. Elliot Prize for Poetry. The Truman State University Press sponsors the award. Saloy, associate professor of English and director of creative writing at Dillard University in New Orleans, won with her poetry collection, “Red Beans and Ricely Yours.” Saloy’s compilation was selected from nearly 450 manuscripts in the ninth annual competition. Saloy is a doctoral candidate at Louisiana State University in English and anthropology. The T.S. Elliot Prize, established in 1996 to honor the poet’s intellectual and artistic legacy, is awarded for a book-length collection of poetry. Saloy will receive $2,000 and have her book published by summer 2005. Ishmael Reed judged this year’s competition for the award. Reed is a novelist, poet, playwright and essayist and has published 23 books and six plays. Reed selected four other finalists, including Indigo Moor of Rancho Cordova, Calif., Jim Peterson of Lynchberg, Va., Jane Langley of Pacific Palisades, Calif., and Leonard Orr of Richland, Wash.
Two Truman parliamentary debate teams reached elimination rounds at the Hatfield Invitational Debate Tournament, hosted by Williamette University (Salem, Ore.) Feb. 25-26. The senior duo of Matthew Harms, economics major from Galesburg, Ill., and Ryan Walsh, philosophy and religion and communication double major from Cassville, Mo., reached semifinal play before losing to the tournament’s champions from Lewis and Clark College (Portland, Ore.). Tyson Helder, senior communication and political science double major from Sioux Falls, S.D., and Samuel Hodge, freshman political science and communication double major from Blue Springs, Mo., competed among the top 16. Harms and Walsh’s performances placed them ahead of teams from the nation’s top debate programs. Additional honors went to Hodge as the ninth place speaker in a field of more than 140 students and Walsh, who was ranked 11th. The Forensic Union hosted the Bulldog Free Debate Tournament at Truman March 5-6, concluding their regular season tournament schedule. They will travel to the National Championships in Lubbock, Texas, during midterm break. Truman’s College Bowl Team earned top honors in the regional tournament at Wichita State University Feb. 18-20. The group took first place against their competition with a record of 11-1. The regional competition included the states of Missouri, Nebraska, Kansas and Oklahoma. Truman beat out the University of Kansas (Lawrence), Kansas State (Manhattan), Pittsburgh State, Southwest Missouri State University (Springfield), Washington University (St. Louis) and the University of Missouri-Columbia in tournament play. Team members include Matt Magruder, senior history major from Kirksville; Brian Baker, senior history major from Hannibal, Mo. ; John Scognamiglio, senior history and mathematics double major from Eureka, Mo. ; Kyle Hill, sophomore history major from Kansas City, Mo. ; and Chris Halsey, junior chemistry major from Liberty, Mo. The teams’s first place finish earned them a spot in the National College Bowl Tournament in Seattle, April 22-24. 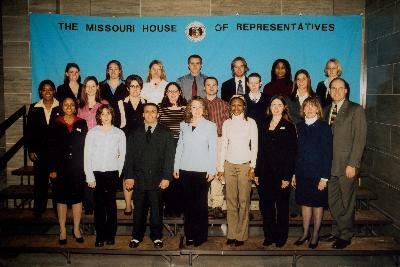 Twenty students presented posters about their research at the Missouri State Capitol in Jefferson City recently. Pictured front row, left to right: Patience Rhodes, Allie Giddings, Philip Esposito, Stephanie Amick, Alicia Lee, Anna O’Brien, Truman President Barbara Dixon and Rep. Bob Behnen. Middle row, left to right: Paya Rhodes, Allison Doores, Jessica Menke, Leslie Contarini, Joshua Schaeffer, Nina McCrate, and Jamie Pohlman. Back row, left to right: Katie Chierek, Ashlee Brown, Pam Bird, Andrew Schwendemann, Jerod Romine, Tiara Pettis and Stacy Lewis. The Financial Aid Office has announced the availability of several scholarships. Clarinda’s Glenn Miller Birthplace Society is offering four scholarships for graduating high school seniors or first-year college students. The society will award $2,400 and $1,200 scholarships to instrumentalists and $2,000 and $1,000 for vocalists. Applicants must submit an audition CD or tape to be postmarked by March 15. The Sigma Chapter of Alpha Delta Kappa in Burlington, Iowa, is offering two $750 scholarships to undergraduate education majors who graduated from Des Moines, Iowa county high school. Applicants must demonstrate success in academics, show qualities of leadership and be involved in extra curricular or community activities. Financial need will be considered but is not the most important consideration. Applications are due March 18. Applications are available in the Financial Aid Office for the J. R. Popalisky Scholarship Fund of the Missouri Section of the American Water Works Association . This $1,000 scholarship opportunity is available to civil or environmental engineering or environmental science students who have an emphasis in career fields associated with water supply. March 18 is the application deadline. The Vice President of Academic Affairs Office recently announced the 2004 graduates who received the President’s Certificate of Recognition for Outstanding Academic Achievement. The President’s Recognition Award is given to graduating seniors who have achieved the 95th percentile or above on their required, nationally normed senior exam prescribed by faculty in each division. The graduating class of May 1998 was the first group of baccalaureate degree recipients to be recognized with this honor. Recipients’ transcripts also indicate this distinction. Fall 2004 recipients include Kevin Bolin, Matthew Coarlyle, Theodore Carnahan, Alex Collins, Courtney Erickson, Ty Fagan, Richard Goering, Christopher Gordon, Staci Imes, Mathew Lineberry, Stephanie Malin, Ann Shirley, Andrew Sistek, Derek Teele, Raul Taranu and Jessica Wakolbinger. Please note entries for the March 22 issue should be turned in by March 11. The Scholastic Enhancement Experience seeks students to serve as Summer Counselors to the Scholastic Enhancement Program. This program will consist of 10-20 underrepresented students who will be freshmen in the fall semester. These students will take an academic course and participate in numerous workshops and activities that will enable them to be successful at our institution. The program will run from June 19-July 22, 2005. The SEE counselor is a full-time position, accountable to Bertha Thomas and Sunnie Hughes, co-directors of the SEE program. Counselors will be asked to provide tutorial and supervisory assistance to SEE participants in a simulated college environment. Counselors live in the residence halls and are assigned counselees of like gender to mentor and supervise. This position entails approximately 40 hours of work per week. All those interested should stop by the MAC and pick up an application. The applications will be sitting on the lower shelf, next to Paula Moore’s desk, in the waiting room. All applications must be turned into Hughes’ mailbox, in the MAC, by 5 p.m. April 4. If you have any questions, contact Hughes at hughess@truman.edu or Thomas at bthomas@truman.edu. A reading and book signing with professor of English Joe Benevento. 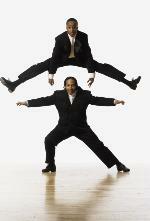 See New York City Tap Festival favorites perform live on stage. Summer per-credit-hour rates will be reduced by 15 percent again this summer. Details on the new fee schedule are in the summer schedule of classes. The discount applies only to on-campus, undergraduate courses and excludes interim courses, graduate courses and study abroad programs. Antonio Scuderi, associate professor of Italian, published “Metatheatre and Character Dynamics in The Two-Headed Anomaly by Dario Fo” in the latest issue of New Theatre Quarterly. English GTRAs Lauren Rosenfield from Lee’s Summit, Mo., Dana Kuhnline from Jerseyville, Ill., and Todd Ruecker from Ballwin, Mo., recently presented papers at the 14th Annual University of Missouri EGSA Conference on Politics and Artistic Response in Columbia, Mo. “Academic Integrity: Copyright Refresher” is the topic for the Weekly Lunch Series from 12:30-1:30 p.m., March 9, in the SUB Spanish Room. “Academic Integrity: How I Handled Cheating and Plagiarism” will move to March 23. Contact the Center for Teaching and Learning at 785.4391 for more information. The Child Development Center will have its second spring seminar from 4:30-5:30 p.m., March 10, in VH 1320. Matthew Killmeier, assistant professor of communication, will present “A Discussion of the Effects of Media on Young Children Today.” The seminar is free to attend, and light refreshments will be served. Childcare can be arranged by contacting the Division of Education Office at 785.4383 at least two days in advance of the event. Omicron Delta Kappa applications for membership are now available in the CSI and the Dean of Student Affairs Office. Applications are due March 11. Contact Katie Lang at kml907@truman.edu for more information. Habitat for Humanity is taking a Collegiate Challenge service trip to Mississippi during midterm break. The organization will help build a home for a family in need. All are invited to attend, and no experience is necessary. Contact Kevin Brown at kbrown@truman.edu for more information. The May 2005 Interim schedule is now available at http://www.truman.edu/pages/431.asp. Registration for May interim courses and workshops will begin March 21 and will continue through the first day of the May Interim. Because students must pay for these courses in advance, they may not register for these courses online. To enroll, students should bring a Permit to Enroll form signed by their adviser, along with proof of payment from the Cashier’s Window, to the Registrar’s Office between 8 a.m. and 5 p.m. any day during this registration period. The Student Recreation Center will have a six-week program beginning after midterm break. The goal of the program is to run the equivalent of a marathon during a six-week period and incorporate strength training. The title of the program is called “Run a Marathon, Lift an Elephant.” Incentive levels vary for beginners and advanced, with prizes for all who complete the six-week program. Sign-ups will be at the Student Recreation Center and various campus locations three weeks prior to the program's start. SAB is sponsoring a karaoke night from 7-9 p.m., March 23, in the SUB Down Under. Admission is free, and attendance prizes will be given. All students are invited to watch and/or participate. Refreshments will be served. Contact Courtney Rakers at 785.4722 for more information. The University Observatory will be open to the public, weather permitting, from 8-10 p.m., March 24. Truman State University’s study abroad program in Chambery, France, still has openings. The six-credit hour program will take place May 29-July 2. The program offers courses in French language and culture at the Institute Francais des Alpes. Students will lodge with host French families. There will be excursions in the Alpine region and a trip to Paris. For more information, contact Patrick Lobert, MC 313A, 785.4062 or plobert@truman.edu.